We have been playing around with a FutureBit MoonLander USB Scrypt ASIC Miner for a few days already and it is time to share our experience with the device. 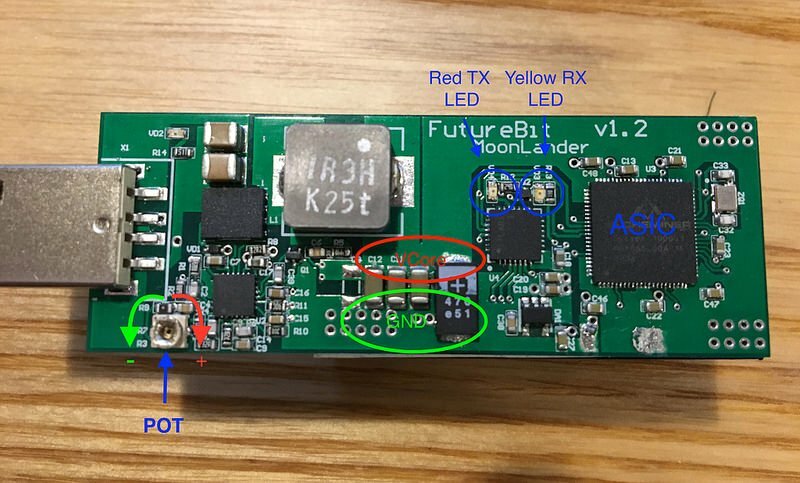 We should start by stating that the FutureBit MoonLander is a small and not very powerful in terms of performance USB miner that is more for fun than for profit. The device is intended for people that just want to play around and experiment with a small and not very powerful Scrypt ASIC that is available at a low price. 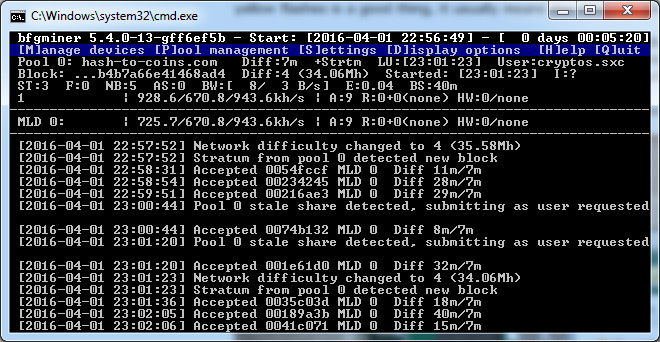 The miner uses a special version of bfgminer 5.4 (source). The MoonLander can run on a very wide range of speed and efficiency, allowing the user large headroom for tweaking and playing around. The device comes with a variable resistor on the PCB that allow the user to adjust the core voltage (0.7-1.1V) and a wide range of operating frequencies that can be set via the software (104 MHz to 400 MHz). Of course you need to be careful playing with these as increasing the operating voltage past the default level of about 0.75V and going past 264 MHz would require the usage of powered hub and active cooling for the miner based on our experience. The official information about the miner performance cites a value of 2.77 KHS per 1 MHz, so the lowest frequency should be able to provide about 288 KHS hashrate for mining Scrypt crypto currencies and the maximum of 400 MHz should result in around 1.1 MHs. With a hashrate in the range 0.288-1.1 MHS for mining Scrypt-basec crypto currencies you will not be able to mine much and you will also have to look for mining pools that offer user adjustable difficulty level or support low fixed difficulty. If we get back a few years to the times of Litecoin mining with GPUs we can say that this miner gets you in between half to almost two high-end GPUs worth of Scrypt hashrate. Of course the power usage of this USB Scrypt ASIC is much lower than what a high-end video card consumes, but then again at these low hashrates you will need many months to even earn enough to cover the cost of the miner. Anyway, our goal was to see what you can get in terms of performance with the FutureBit MoonLander miner by powering the device with a regular USB 2.0 and USB 3.0 ports with their power limits that do not allow the miner to reach its maximum performance. You will need to use a powered USB hub in order to be able to overclock to the maximum the miner, a 2A powered hub should allow you to reach the 10W maximum power and you will also need to provide a serious active cooling to the device if you want to push for higher core voltage and the maximum supported frequency. Out tests have shown that the default operating frequency of the device set at 144 MHz is what is possible with a USB 2.0 port capable of providing 0.5A at 5V or about 2.5W. With this operating frequency and using the stock core voltage of about 0.75V you can expect to get around 400 KHS worth of Scrypt mining power. On the thermal images above you can see the operating temperatures at these settings, the AlcheMiner ASIC chip does get hot with temperatures of around 55-56 degrees Celsius and the heatsink on the back is at about 44 degrees Celsius. These temperatures should not be a problem for operating the miner without any additional cooling on the long run, unless of course the ambient temperature is not very high. Going for the higher power limit of USB 3.0 ports that are capable of 0.9A at 5V or about 4.5 Watts of power you can push the device to an operating frequency of 264 MHz. Any higher and the power provided by the USB 3.0 port will not be sufficient enough to keep the miner operating properly. The expected hashrate at these settings should be around 730 KHS, a result that is not bad but we were hoping for a bit more. Apparently achieving 1 MHS or more will be possible only with the use of a powered USB hub that can provide more power to the USB miner and 2A is needed for pushing things to the maximum along with cooling fans as already mentioned. It is important to note that the thermal camera photos show an increase of about 15 degrees for the ASIC chip and about 10 degrees for the cooling radiator when using USB 3.0 as compared to USB 2.0. Note that at this level adding some airflow around the miner is a good idea in order to keep it cooler as otherwise it may overheat after a while, so it will be a wise idea to monitor the operating temperatures. All in all the FutureBit MoonLander USB Scrypt ASIC miner is a fun little gadget to play around with and that is what it is for – playing around with an affordable ASIC miner. It is not intended to be profitable or to make you a lot of money, it is for people that are curious like us and love to play around with tech. The next thing we are probably going to do with the device is to improve on cooling and try with powered USB hub and some overvolting and more serious overclocking of the device. Do note that increasing the operating voltage and trying to max out the operating frequency can decrease the live of the mining hardware and even damage it permanently if you are not careful what you are doing! 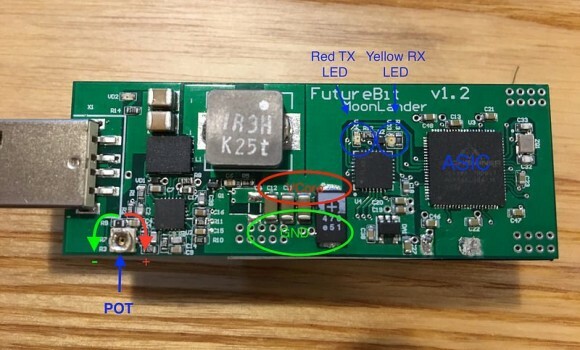 The FutureBit MoonLander is an ASIC Scrypt USB stick miner made by jstefanop on Bitcointalk that is based on a single Alcheminer AlcheMist Scrypt ASIC chip. 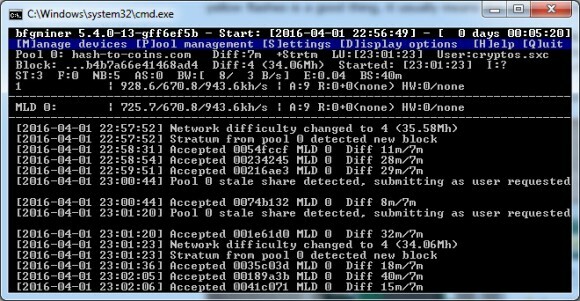 A small SCrypt-based ASIC miner intended to provide a hashrate between 0.4 and 1.2 MHS with a power usage of about 5W per megahash. The device is user overclockable with voltage adjustment available via a variable resistance potentiometer on the board and clock setting via the software miner. Using the device directly plugged into a USB 3.0 port you should be able to push it somewhere close to a Megahash with the available 4.5W of power, for more you will need a powered USB HUB capable of providing more power to the USB miner and probably active cooling. We have purchased a single unit in order to be able to try it out and see how well it performs, so you can expect our first impressions and test result from the FutureBit MoonLander very soon. The price of the FutureBit MoonLander USB Scrypt ASIC miner is $39 USD plus shipping and you can order directly form jstefanop over at Bitcointalk or get it via some of the official resellers while they have units. There are two US resellers – Asicpuppy and HolyBitcoin and there is one reseller for Europe – Bitshopper. Do note that these USB Scrypt ASIC miners won’t make you rich mining Litecoin (LTC) and even ROI won’t be very fast at the current moment, they are not meant for that. The FutureBit MoonLander is a handy little device that is affordable enough for people that want to experiment with Scrypt mining for fun. With that said however if you point the miner at some Scrypt altcoin with low network hashrate and difficulty, mine some coins and then sell them at the right moment you can still do pretty good.